Replacement:BOB-10104. The new revision fixes the silk error so that the '+' and '-' are in the right place. This page is for reference only. 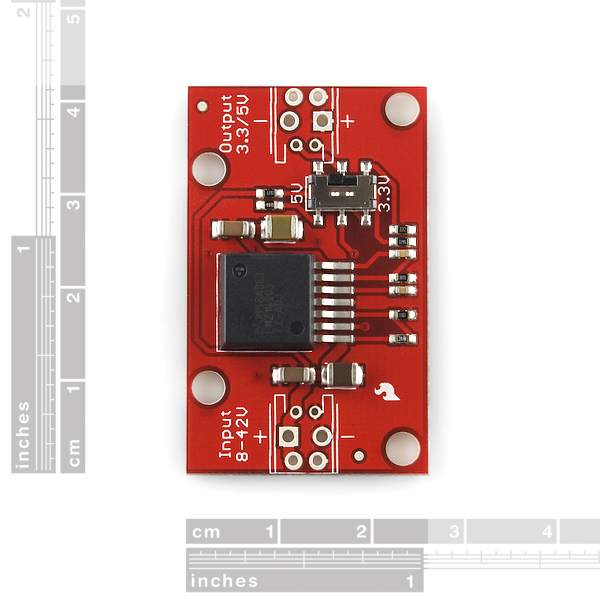 This is a breakout board for National Semiconductor's LMZ14203 Simple Switcher Power Module. 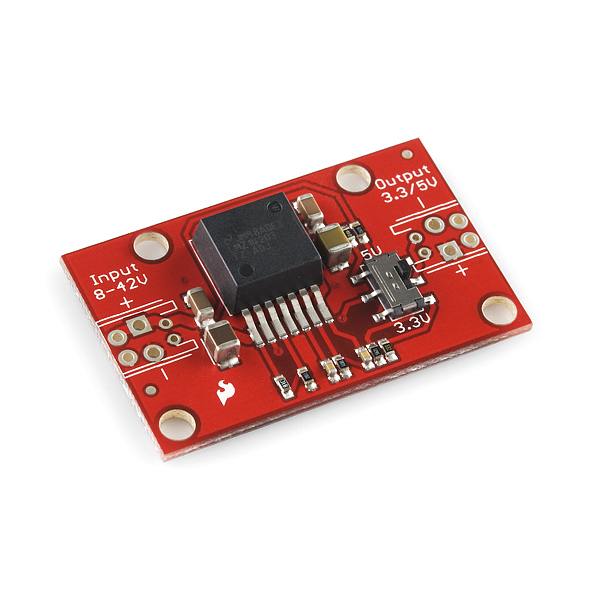 The LMZ14203 is a highly efficient DC-to-DC step-down converter that is capable of driving up to 3A. It's an excellent choice for a project that requires a lot of current, high-efficiency or large voltage step-downs. 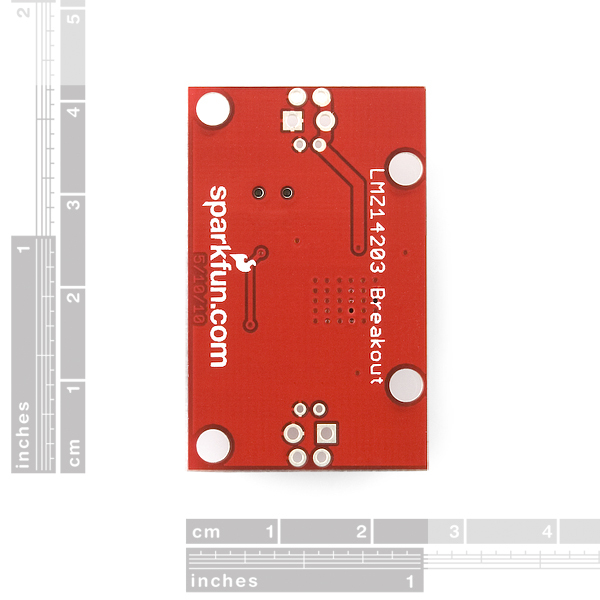 Our breakout board for the LMZ14203 is configured to deliver your choice of either 5 or 3.3VDC output. The input voltage must be at least 8VDC and can be up to as much as 42VDC. A flick of the DPDT switch allows you to choose the output voltage, but take care not to change the position of the switch while the board is powered and under load. We couldn't decide what type of input/output interface would be best for this type of board, so we left the choice up to you. As always, there's the standard 0.1" pitch header, but you can also use a 3.5mm screw terminal or a through-hole JST connector. The JST connector is only rated for 1A, so, if you use that, don't try to get the full 3A throughput out of the power switcher. **Note: **Whoops! The '+' and '-' indicators on the output side of the board should be swapped. Silly engineer... This will be fixed as soon as possible in an upcoming revision. This note will come down when the silk is fixed, but for now you can tell which side is positive by the thick trace running through the holes. Or you could get Pololu Step-Down Voltage Regulator D15V35F5S3 (http://www.pololu.com/catalog/product/2110) that can do 3.3V or 5V at 3.5A for $15 or 7A for $25. This is very over priced. If you look on DigiKey, it's $21 for just the chip. While the Pololu looks like a great board, it can't handle the input voltage this can. Pololu has some that can handle 42V, but they can only supply .6A. I've spent the last couple weeks looking for options from TI, LT, MAXIM, on DigiKey and Mouser. This isn't a bad deal if it's what you need. Thanks for the link, that looks very nice. I am connecting a 24V battery to the LMZ14203. Even with no load connected to the LMZ it seems like there is a large initial current spike. If I put an inductor inline with the negative input would that should suppress any initial current spike right? Since it is operating at DC input the inductor shouldn't effect the circuit any after the initial conditions go by and the circuit reached steady state right? 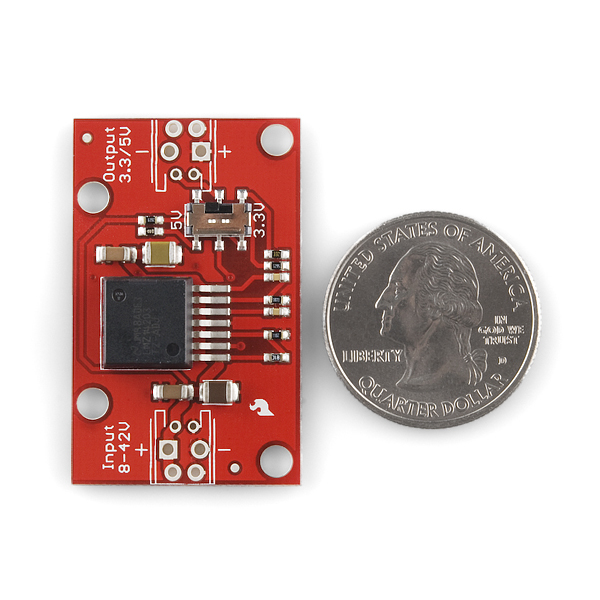 What's the advantage of using the LMZ14203 as opposed to, for example, an LM2676? Seems like you're paying $10 more to get a $1.50 inductor. That might make sense if you're tight on board space, but for hobbyist use?? In my opinion, continuing to ship a power supply board that contains reversed polarity symbols on the output side seems irresponsible to me and adding a "Whoops! The '+' and '-' indicators on the output side of the board should be swapped. Silly engineer..." comment just doesn't cut is as a workaround. As errors go, this is a big one. Some poor sap is going to get one of these and then forget about this note and blow out their entire project. Or worse, injure themselves from a capacitor explosion (see http://www.youtube.com/watch?v=D-RZ5RTAdSg). I understand that it's distasteful to dump some otherwise functional boards, but this one should be. I would buy 5-10 of these if they were in the $15-$20 range and a matching step-up was available. LOL, the funny thing is National sells a demo board like this but without the switch for fifteen $. It's tempting to think that the problem switching while powered on could be fixed by designing the board so that with the switch in one position there's one resistor, and in the other position there are two resistors paralleled. e.g., for the R-ON resistors you'd have 100k and 100k || 160k ~= 61.5k.